ChuZhou HongSheng Sports Production Co., Ltd., (Yao Jie Golf), is one of the top leading manufacturers of golf soft goods products in China. Its customers include Callaway Golf, TaylorMade, Cobra PUMA, Cleveland Golf, and many other international brand name companies. The factory’s primary product is golf head covers, but also makes golf bags, travel covers, duffel bags, computer cases, and racquet cases. The total production area is over 130,000 s.f. in two buildings and the workforce is about 300 personnel. Nearly 4,000,000 head covers are made annually. With a full range of equipment and machines, the factory laminates backing material, cuts, embroiders, weaves sock material, and sews its products with the highest level of workmanship and quality control. Using advanced techniques for sourcing and production, the factory is able to maintain on-time delivery schedules and pricing at very competitive levels. The factory meets the stringent social and facility qualification standards of companies like Callaway, TaylorMade, and Cobra-PUMA. Special attention to the care and advancement of all workers results in high morale, productivity, and quality workmanship. 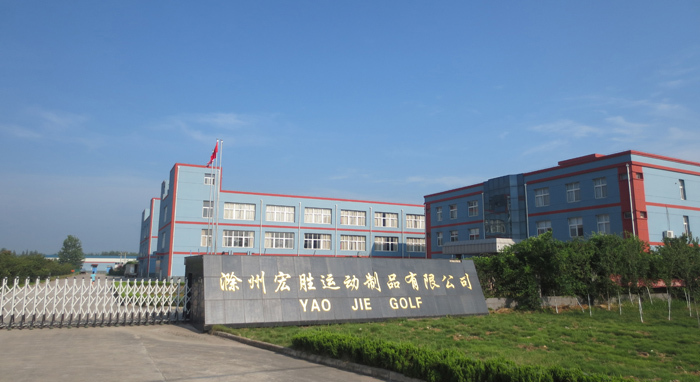 Established in 1996, Yao Jie Golf is located in east Anhui Province within one hour of Nanjing and three hours of Shanghai. Shipping and visiting transportation is very rapid and convenient. Shipments are made through ports in Shanghai or by truck to the Guangzhou region.